Hello, this is in regards to the normal version (not RealUI 8) - how do you set raid target markers? I remember there used to be a slide out menu under the minimap but it's gone and I have no idea if I disabled it or if it's bug. Its now along the right side of the minimap. Also Nib, Just saw this, but the Bagspace numbers arent showing, is this normal? No those are only world markers. I'm talking about target markers. Wow! So many changes! Definitely gonna test this out! Thanks Nib! At this time Grid2 for healer is useless. I use vuhdo instead. Because not all hots are shown in the raidframe although it is configured and the player have gotten the hot. For example rejuvenation. I configured it to show as an icon on the left side. The first time I give a player this hot it will be shown in the grid frame but the next player who get the hot it won't be shown. Think that's not your issue as Grid2 isn't your addon but I want to tell you though. Note: In V11 Harmony is back in the tracked auras. Last edited by high55555 : 06-19-13 at 03:35 PM. Hey Nib, just wanted to thank you (again!). I have just done Halls of Flesh-Shaping. v10 held up well! Oh wait, there's a v11?! Thank you so much! I had never ever had to set raid markers myself but from the older versions I remember I would have to click the pop out menu to left side of the screen under the minimap, but it's not there anymore with 7.4. But what you told me was an easier alternative, and thank you again Nib! I develop my own custom interfaces by matching addons that I find useful and then forming them into a very clean, lightweight interface. I did that because I used your interface in the past and loved it, but it did not have enough information available for me. So I used your interface as a template and then eventually just started to build my own. Nowhere near as fancy as yours, but simple, light, and it gives me the information that I require when looking at my screen. I honestly thought you had stopped developing a while ago. This beta just looks great. It is beautiful to look at and the amount of work you put into it is apparent. I wish I had your talent to make something like this. I am downloading it right now and I will be installing it on my machine. It is the first time in a few years that I have installed a compilation on my machine that isn't something that I had designed and put together for me. Even if I don't keep it, I will be using it as a tool to learn a few more things from you for sure. Loving V11. Thanks so much nib! Is there anyway you can allow us to add Aura Tracking to bars that you have? I'd like to add Shadow Flame for my Lock and then be able to add more cooldowns to Player Aura's would be great. If that can't be done, I know that if I go from Destruction (Lock) to Demonology, the Corruption aura is using the Immolate Aura (from Destro). It's almost if respecing retains the icon of the prior spec. So, if I'm in Destro, I put up Immolate, and it's completely fine. Then I respec into Demonology, put up Corruption, and the icon displays the Immolate aura. Otherwise, holy moses, what a UI. I loved it before but now it's just wildly impressive. The cast bar, target cast bars, player auras and target debuff auras are REALLY well designed. No customization yet, working on a config window now. Will have that icon issue fixed up. first: This compilation is very nice. Thanks for the work and Support. Grid2 don´t show me my Renewing Mist buff in the Raidframe. I always use Vudho with my old UI. Is there any way to change the Raidframes until Grid 2 is fixed to show Buffs, Debuffs ? Just deactivate Grid2 and replace it with your favourite unit raid frames. I use vuhdo, too, as Grid2 is very buggy at the moment. The only issue is that you have to configure vuhdo by yourself, the raid config menu of RealUI is disabled if you deactivate Grid2. You can also add the buffs/debuffs you want to watch manually to Grid2. 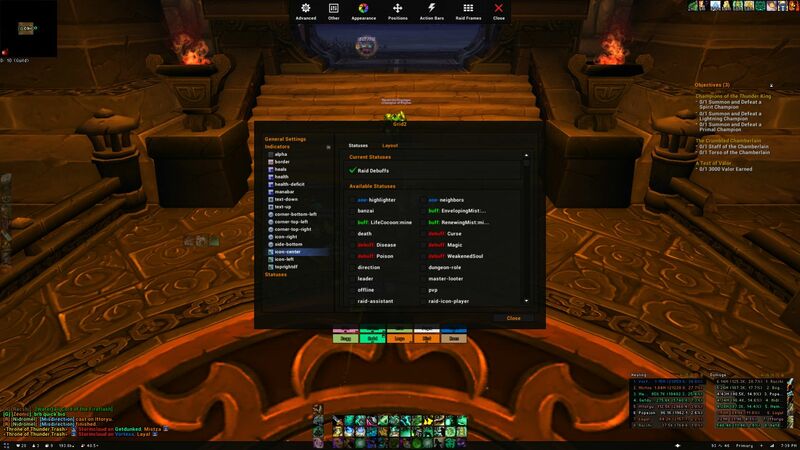 You can get to it by clicking "Advanced Settings" in the Raid Frames section of the RealUI config. Graid2 is no more complicated to set up than Vuhdo, and imo it's easier.